After the 2 breakfasts that we had, we went to Queensbay Mall (because it was also raining and we had to abandon any outdoor jaunts) … not that we had anything to shop for, but it was more like we had to exercise a bit to work off that heavy double-breakfast! After a couple hours of aimless window-shopping there, we decided we had enough and headed on to my must-have Assam Laksa! 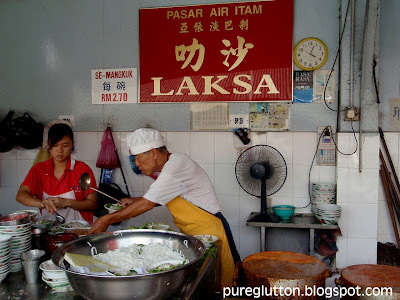 The Air Itam Market Assam Laksa is a must for me whenever I visit Penang. 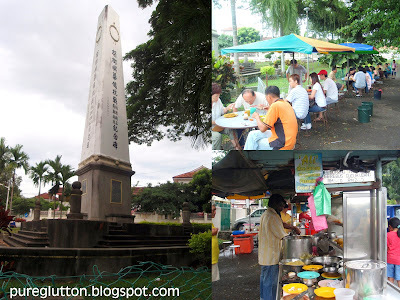 I have tried some of the other popular assam laksa in the island but somehow this place holds the No.1 spot for me. It’s not exactly the most glamorous location 😉 but then, hey, I’m a loyal supporter of this enterprise! 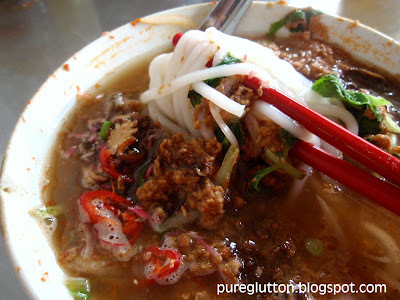 We had hardly taken our seats and before we could even blink, bowls of hot steaming Assam Laksa appeared on our table. Ahh… the familiar ceramic bowl, the metal soup-spoon, the red chopsticks – this assam laksa has its own personality which can’t be found anywhere else. LL wanted to order his 2nd bowl but he was stopped by SIL who said that there’s another assam laksa joint down the road which she insisted we had to try. Oh well, more about that below. 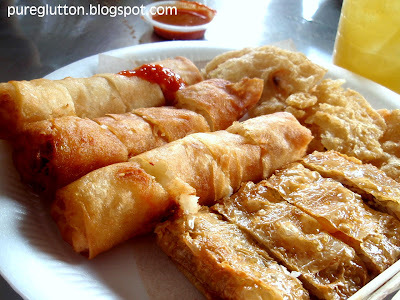 We had fried popiah and some fried fuchook (beancurd skins)… hmmm… fresh out from the wok of hot oil… I think they were just decent but not mind-blasting. Just across from the Asia Cafe, there was a cluster of stalls by the roadside… and chairs and tables with umbrellas set up along the side lane. 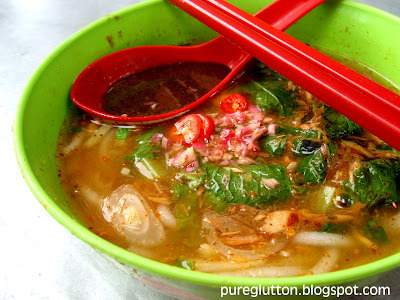 Verdict: Hmmm… we should have stuck to the Air Itam Market laksa!!! The laksa here was bland and totally unexciting. It just did not hit it off, ok. I almost wanted to turn back to the market to satiate our cravings… but then SIL suggested we tried the Fried Mee Mamak which she also said was good. As you can see, when this plate of noodles was served, I thought the guy had given us the wrong item. 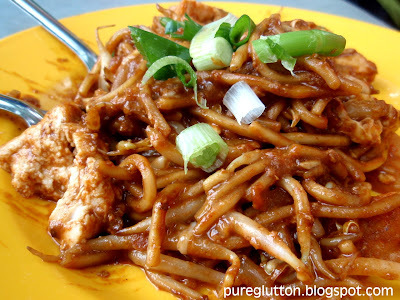 It looked more like mee rebus than fried mee… it was way too “wet” to qualify as “fried mee” methinks. Taste-wise: nahh, forgettable. Pretty tasteless, noodles were too soggy, totally no oomphh. After the spicy food in Air Itam and the disappointment at the 2nd venue, it was time to head back to the city for some refreshing dessert. 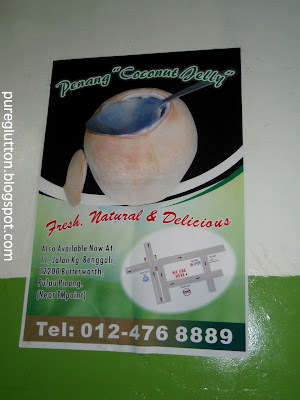 CK Lam told me we absolutely must try the Penang Coconut Jelly in Jalan Dato’ Keramat! We managed to get a parking along one of the side roads perpendicular to the busy Jalan Dato’ Keramat and headed into the shop. 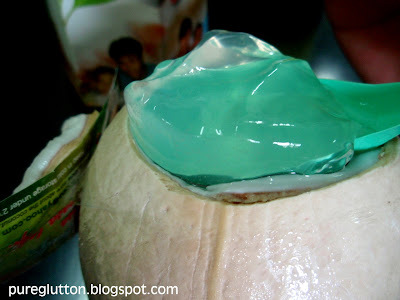 … yummy refreshing soft smooth jelly straight out of the coconut! After spooning all the yummy jelly into our mouths, proceed on to the coconut flesh which was just the right “age” – not too soft nor too hard! 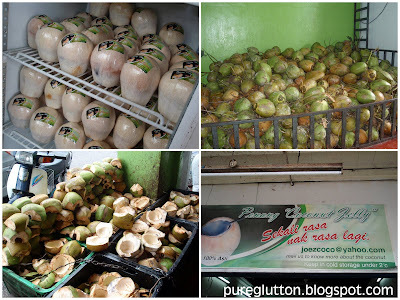 Of course Joe the boss there refused to tell his trade secret as to HOW they made the jelly inside the coconut using the natural coconut water only. Hmmm… using the “injection” method perhaps? Joe did mention they will market this in the Klang Valley later, in a big way… so all you people here in the KV just have to be patient, ya! 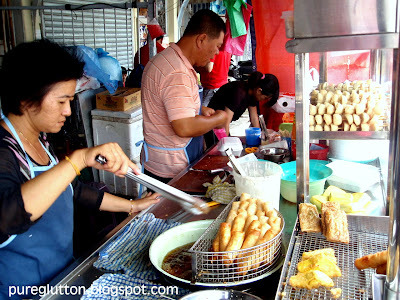 Look out for my next & final posting on my makan trip to Penang – the BEST Lobak there! it's a father and son empire thingie. 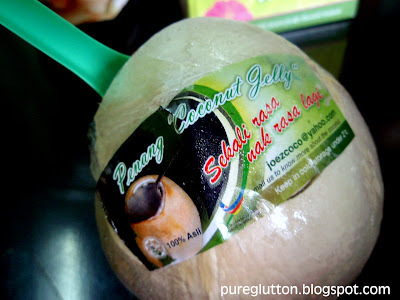 yup, they do inject the jelly into the coconut. it's formed inside the coconut itself. refreshing nonetheless. the Manjung original one, manned by the father, is priced at only RM3. IF you ever go to Manjung, that is. 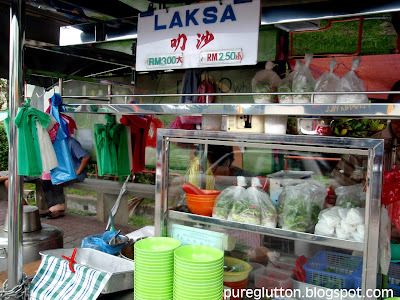 Next time, you may like to try the laksa in kulim. It is not bad either. I have not been to the Air Itam Laksa stall for ages. Don;t quite remember how it taste like already. One of the put off are the prices! air hitam assam laksa is my fave. The old Air Itam Laksa and new concoction coconut jelly. Good combination! yar man..boy does the food look piping hot and fresh! the popiah looks scrumptious! i like it! 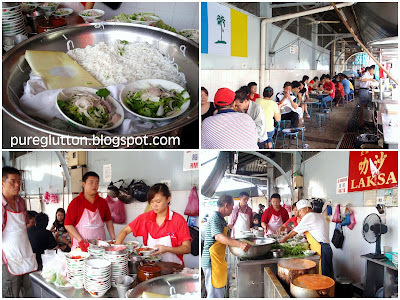 Jason: Wow…Kulim! Have not been there before but thanks for the recommendation. LFB: Ya, the jelly was really good and refreshing. worldwindows: you are right – it was indeed a perfect combination! Claire: Yeah, do try this jelly – u will love it! Ciki: Yeah, the laksa was piping hot & yummy! Unka: ya, the price has gone up tremendously. Didn't see any mee goreng stall near there, though. Leo: Inside the temple? Can't recall any there.